The eminent industrialist and a philanthropist, Dr Sitaram Jindal, founded Jindal Naturecure Institute in the year 1978. The hospital has decades of experience in providing naturopathic treatments for patients who are seeking relief from chronic conditions. Over the years, JNI has earned the title of being the best naturopathy hospital in India. The factors that go into making Jindal Naturecure one of the top naturopathy centres in India. Jindal Naturecure Centre has a team of highly skilled doctors who offer personalized treatments to each patient. They make patient health the top priority and take the time to consider various factors such as lifestyle and medical history before offering the right treatment. The doctors are all specialists in their chosen fields and have years of experience in helping patients deal with various chronic conditions. Jindal offers treatment for an extensive variety of health conditions. From breathing conditions and hormone imbalances to age-related illnesses and lifestyle-related issues, JNI offers the right nature cure treatment for every condition. The medical professionals make use of naturopathic treatments, yoga and lifestyle modifications to activate the body’s natural healing ability to fight off the illness. 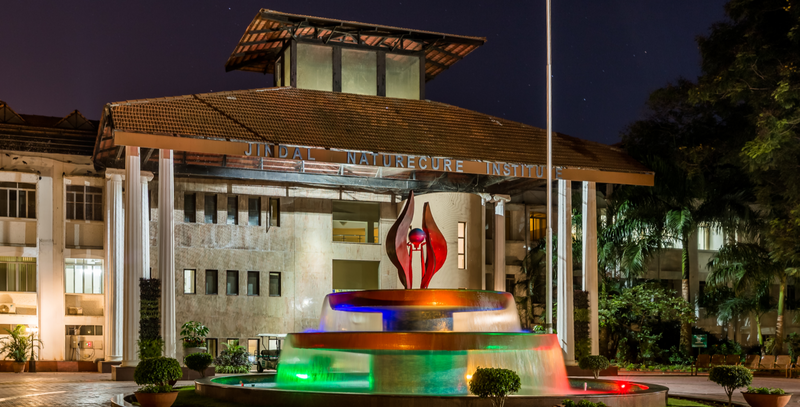 The medical professionals at Jindal Naturecure Institute advocate for the best natural treatments and lifestyle choices that can be implemented for effective results. Naturopathy: Jindal as a top naturopathy centre in India offers Holistic therapies to eliminate or reduce the dependency on drugs to treat chronic or persistent medical conditions. Diet Modifications: The right diet ensures the right nutritional intake and helps speed the process of recovery. Yoga: Low-stress forms of activity such as yoga can help stimulate blood flow and reduce muscle tension. Massages: One of the best ways stimulate the body and eliminate stress and tension is through massages. Spread over 100 acres, the campus boasts lush greenery and picturesque views of the lake. The hospital offers luxurious accommodation with the economy, premium and deluxe options. All rooms are aesthetically designed to create a soothing atmosphere and are fitted with all the necessary amenities. Head to Jindal Naturecure Institute and transform into a healthier and happier version of yourself with the help of holistic treatments and lifestyle transformations.